We are pleased to welcome you on the website of Fabryka Transformatorów w Żychlinie sp. 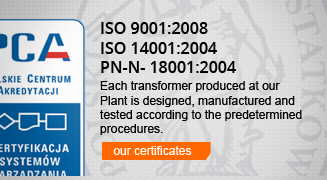 z o.o., a manufacturer of HV and MV power transformers with more than 90 years of tradition and experience. We are a popular and valued supplier of transformers in Poland, and some of our power transformers are manufactured for export purposes. A significant outstanding feature of Fabryka Transformatorów w Żychlinie sp. z o.o. is the broad range of products. 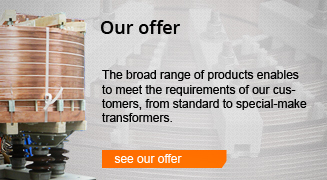 We specialise in non-standard transformer versions. Their properties such as: loss level, short circuit voltage, earth fault impedance, dimensions, equipment and many other parameters can be customised to your needs. As a winding material can be used copper (Cu) or aluminum (Al). On our website you can find Technical Sheets of standard units as well as information on special and non-standard versions. In case of the latter, you can send us a request for providing technical data. Our products combine many design solutions enabling wide applications in the industry and in the power sector. Owing to our long-standing experience in sales and production of transformers, we are able to quickly adjust our products to the market needs.